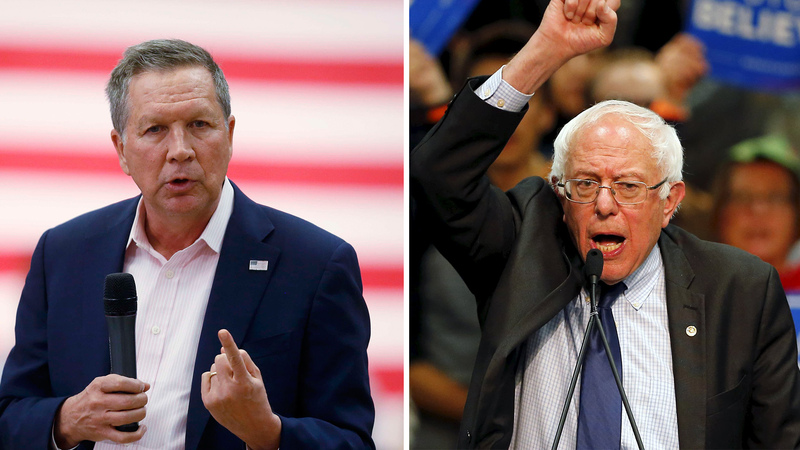 Donald Trump and Hillary Clinton continue to lead their respective fields for their party nominations, but John Kasich and Bernie Sanders would perform the best in the general election, according to a Quinnipiac University poll released Wednesday. The poll found 43 percent of Republican voters support Trump, 29 percent back Ted Cruz and 16 percent support Kasich. Meanwhile, half of Democratic voters said they support Clinton and 38 percent back Sanders. In hypothetical general election match-ups, Sanders would beat Trump by a wider margin than Clinton. Clinton would defeat Trump 46 to 40 percent while Sanders would defeat Trump 52 to 38 percent, the poll found. Kasich, however, would beat Clinton in a general election race 47 to 39 percent and Kasich would just edge out Sanders 45 to 44 percent. More than half of American voters said they definitely wouldn't vote for Trump this year, while 43 percent said the same for Clinton and a third held that belief about Cruz. Asked about the recent violence at Trump's campaign events, 37 percent blamed the violence on the GOP frontrunner while 27 percent said he's somewhat responsible. Just under a quarter said Trump is not responsible at all. Nearly 40 percent said protesters are very responsible for the violence and the same number said they are somewhat responsible. The poll comes a day after Trump won the Arizona primary while Cruz won Utah and Clinton won the Arizona primary and Sanders won in Utah and Idaho. A Monmouth University poll also released Wednesday found that 41 percent of Republican voters back Trump , 29 percent support Cruz, 18 percent support Kasich. A majority of Democratic voters said they support Clinton and 37 percent back Sanders. The poll surveyed 1,451 registered voters between March 16 and 21 with a 2.6 percentage point margin of error. The poll surveyed 652 Republicans with a 3.8 percentage point margin of error and 635 with a 3.9 percentage point margin of error.